Dr. Putnoky and Dr. Horstmann make a good team. Life has not been easy for Juliana Q., yet you would never know by the big smile on her face. While speaking with Juliana on a recent visit with her Rheumatologist, Gilbert Putnoky, M.D., Juliana shared her story. She is a daughter, a sister, a mom, a grandma and she handles all these rolls like no other. During the week, she visits her mother-in-law at an assisted living residence, she also cares for her 91 year old father, she is raising two of her grandchildren as well as being a part-time care-taker for her brother. All this would be trying on the healthiest person, yet Juliana handles it all in stride. She had a heart-attack last year and also has rheumatoid arthritis, yet she doesn't complain. 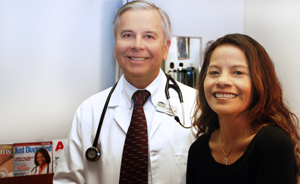 What she does say is that Dr. Putnoky and her primary care provider, Jonathan W. Horstmann, M.D. are her lifesavers, she said, "they are a good team." She also stated, "Without Dr. Putnoky, I wouldn't be able to handle the tasks that I do every day. I wouldn't be able to live independently."